It’s been nearly twenty years since I started to research Revolutionary Boston intensely. At first my goal was to develop a sense of what it was like for a young apprentice to live in Boston in 1770. Among the early books I read was Patricia Bradley’s Slavery, Propaganda, and the American Revolution. 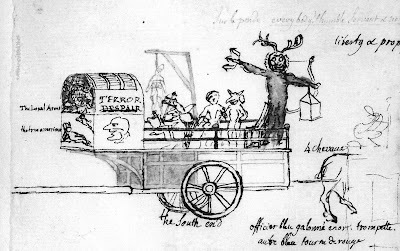 Almost in passing, Prof. Bradley mentioned that there were sketches of Boston’s Pope Night festivities at the Historical Society of Pennsylvania. On-the-spot pictures of what an apprentice would have seen on 5 Nov 1767! At the time I had grandparents living outside of Philadelphia, so during a visit to them I took a day to go into the city and research at that organization. 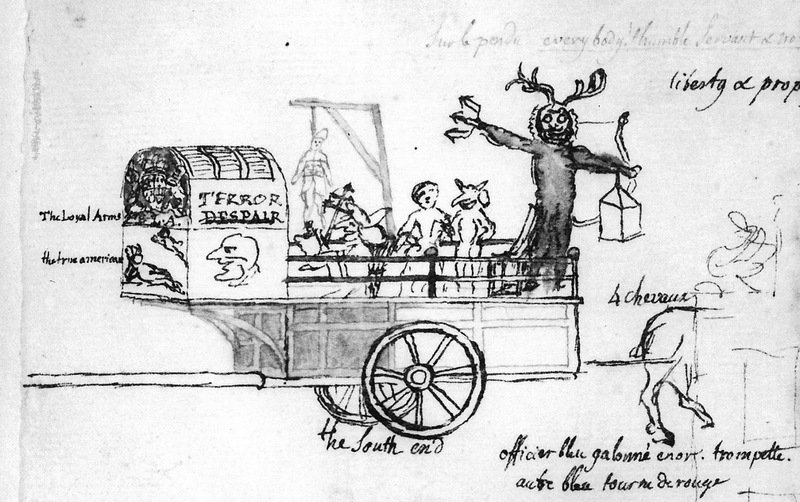 Sure enough, its documents from the Swiss-born artist Pierre Eugène du Simitière included several sketches of youths tugging decorated wagons like this one, from Boston’s South End gang. The first time I attended the Dublin Seminar for New England Folklife, I mentioned those pictures to director Peter Benes. He invited me to write an article analyzing them for the seminar collection slated for 2003. The H.S.P. sent me photographs—on actual glossy paper, not pixels—and gave permission for them to be published for the first time. That was my first journal publication. In 2006 I began this blog. 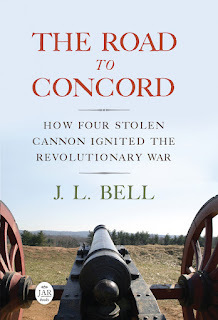 I continued writing articles, chapters for books, a big study for the National Park Service, and eventually The Road to Concord. 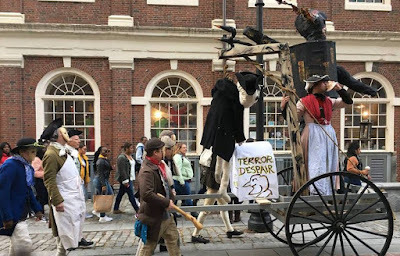 Folks at local historical organizations whose job is to look ahead as well as back noticed that the sestercentennial of the American Revolution in Massachusetts was upon us and started Revolution 250, and I joined that effort. This past weekend, I was speaking about where Gen. George Washington slept in Cambridge, a result of the N.P.S. study. That required being at Mount Vernon, and it was a great experience, both educational and fun. Most unfortunately, that meant I had to miss the “Devil and the Crown” reenactment on the streets of Boston the same afternoon. And look at what that event’s amazing volunteers and interpreters did! Photograph from Jim Hollister’s Facebook feed. Check out the Facebook pages of Minute Man Park and The History List for videos. One thing that I think gets forgotten about Pope Night/Guy Fawkes Day, is the anti-Catholic origins of these celebrations. Hatred against all things Catholic in early America was vitriolic and later led to extreme violence against Catholics. This distrust and hatred/fear was strong until not very long ago. Remember how much people questioned the legitimacy of a JFK administration all due to his faith? That was just over 50 years ago. I experienced it in the early 1970s in the form of teasing and bullying as I was the only Protestant kid living in a Catholic neighborhood in NE Philadelphia. Sometimes it bothers me when I see films like "V for Vendetta" that seem to forget/ignore that Guy Fawkes, the Gun Powder Plot, and it's aftermath were more about religion than politics. All in all, many of America's founders understood how religious differences could tear a nation apart, because they saw it with their own eyes. And it wasn't just Catholics that suffered extreme violence. For example, Baptists suffered much in Virginia. The elimination of religious tests and the First Amendment were born of the knowledge of how decisive religion can be. Unfortunately, then and now, Americans often ignore the wisdom of the founders and the spirit of the Constitution and engage in violence and hate speech against people of different faiths. One does not have to look around to hard today to see how true this is. In this past weekend's reenactment of 5 Nov 1767, the organizers chose to downplay the anti-Catholic imagery by not including a “Pope” among the effigies and referring to the event as the Fifth of November rather than Pope Night. However, the informational brochure that I drafted included paragraphs acknowledging that Boston’s Fifth of November tradition was anti-Catholic. That reflected not only New England’s Puritan heritage but also how patriotism was defined in the eighteenth-century British Empire as opposed to the Catholic powers of France and Spain, opposed to the Catholic Stuarts, and opposed to British Catholics having political rights. That brochure also pointed out that within ten years Boston went from celebrating Pope Night as usual to welcoming thousands of French soldiers and sailors to having a Catholic church in the town. That didn’t spell the end of anti-Catholicism in Massachusetts by any means, but it was a remarkable and unplanned effect of the American Revolution.